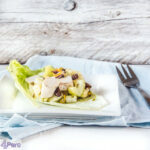 A delicious recipe for a skinny Waldorf salad with tender chicken, fresh vegetables and fruits and crunchy nuts. Covered with a yogurt based vinaigrette. I had some chicken leftover from a meal and that was just not enough to make a meal for the five of us. And because it is still January I especially pay attention on healthy food, so I thought to make a lovely fresh and lean chicken salad with it. The chicken I blanched in boiling water, so that he remained very juicy. Furthermore, I add celery and apple slices, pistachios and raisins mixed. Just like in a Waldorf salad, because this is really becoming a derivative. And not for nothing, for a Waldorf salad has just the right flavors brought together. Where you put a great dash of mayonnaise in the Waldorf salad, I used a vinaigrette with a yogurt base this time. Just a little lighter and just as tasty. When my hubby and I were eating the salad for lunch, my youngest saw his chance. Mmm, was all he said, and at the end of the song, I had only half a salad left. So it became an extra skinny salad ;-), and it was approved anyway. Bring a pan of water to the boil and poach the chicken for about 15 minutes, until done. Cut into small cubes and let it cool to room temperature. Cut the celery into small loops. In a bowl mix the diced chicken breast, celery, apple, pistachios and raisins well. Make a dressing of yogurt, olive oil, mustard and spices. Pour over the salad and mix again thoroughly. The recipe for this pasta salad is simple, just six ingredients and therefore it is amazing that it has so much flavor. Delicious when served either warm or cold. 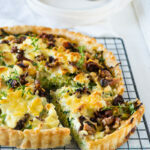 It’s food blog swap time: I will cook again for another blog that is assigned to me and this time is that the site Etenvaneefke. 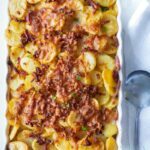 Eefke also suffers from food intolerances and has started a blog with delicious recipes. I certainly discovered some tasty dishes. And when my eye fell on the pasta salad with smoked chicken, arugula and pesto. And a pasta salad can be eaten at any time of year. Cold in summer and warm in winter. And so I decided today to serve the warm variant for lunch. And o so great: this recipe was received with cheers. But yes, each ingredient is giving the dish that little extra without dominating. So a truly delicious recipe! I find that raw onion can dominate in a salad, I have been omitted from the original recipe. Feel free to add it anyway. you eat it warm, stir the arugula in just before serving so it will stay fresh. you stir the pesto through the pasta, you do not have to use extra oil to the pasta. Cut the smoked chicken and sundried tomatoes into small cubes. Cook the pasta al dente according to the manufacturers instructions. Meanwhile, toast the pine nuts, golden brown in a dry frying pan. Mix the chicken and sun dried tomatoes with the pasta. Just before serving, add the arugula to the pasta salad, so it stays fresh. This recipe contains crispy raisin French toast baked on two sides in an airy egg mixture. And instead of sugar, sprinkle the French toast with a delicious sweet beer sauce. But very occasionally it happens that there is still some bread left. And by then you can use it easily t make French toast. Tasty bread soaked in egg, sprinkled with a little bit of sugar. But in the beer week I try to give French toast my own twist of course. So I started to use the egg mixture instead of milk with a little beer. I replaced the sugar with a beer sauce. It was a delicious lunch, which only I enjoyed (because yes under 18 no …). this time I had currant bread, so I used that. But this is also very tasty with white or brown bread. this is a sweet lunch dish I used a sweet brown castle beer. You can also use another sweet type of beer, for example cassis beer. you don’t want crunchy sugar sauce so use a liquid sweetener or icing sugar to sweeten the sauce. I chose honey. Put the honey, the orange peel and the beer in a blender and mix until frothy. Beat the egg with 3 tablespoons of castle beer. Soak the raisin bread on both sides. Melt the butter in the pan and brown the sandwiches on both sides. Serve the French toast with a dash of sauce. Viva Espana! This recipe for an airy Spanish omelette is deliciously filled with tuna, tomatoes, capers and thyme. In Spain you can enjoy delicious food. The Tapas country, tasty paella’s and many seafood dishes. A country where my food heart starts to jump. And if we go to Spain for a holiday, I always eat and try new food. Have a nice meal at a cozy beachside bar. Like the one we found on the beach where only locals come, with Spanish music, wide spread and almost empty (on weekdays, because on Saturdays and Sundays it is full of Spaniards) beachside where they serve delicious food and Sangria. During the week we relax there and enjoy the rest and in the weekends we look at the colorful scenes because the Spaniards drag on a lot of stuff from home to the beach . Complete tables, chairs and lots of food. They are busy people and the food smells real good. This lunch dish I made today fits that beach. Tasteful, with tuna fish, simple and yet full of flavor. I’ll be totally relaxed again. If you want the omelette to be smooth, let him lightly fasten at the top, but not over and over. Cut the sun-dried tomatoes into strips. Add the tomatoes, capers, thyme and tuna. Slice the tuna small if necessary. Heat a little olive oil in a pan on high fire. Add the omelette mixture. With a wooden spoon bring a bit of egg to the middle until it's just solidified, but not dry. Fold the top 1/3 inwards. Also fold the bottom to the middle and slide on a plate. This month’s food blog event is dedicated to: the French cuisine. Joyce and Tom’s blog aboutfoodandmore thought of the theme because they were the winners of the food blog event in January. A really great theme, where I’ve let go my thoughts for a moments. But then I knew: Florentine eggs with spinach. Original French cuisine and delicious! The eggs are still a bit soft and from our own chickens with fresh spinach (fresh from the garden) and a delicious sauce. We enjoyed it very much! I adapted the original recipe (from the cookbook Le Cordon Blue) a bit to make it as regional as possible and opted for a delicious aged cheese of our own COOP store called the Landwinkel. Heat a pan of salted water to the boil. Add six eggs and bring the water back to a boil. Then boil the eggs for 5 minutes. Peel the eggs under cold running water (let the shell peel easier) and set aside . Bring a second pan of salted water to the boil. Meanwhile, wash the spinach thoroughly. When the water boils, add the spinach . At the time the water boils again, you get the spinach out quickly and transfer it into a bowl of cold water so that the cooking process stops. Take the butter and melt. Make a sauce by adding the flour and stir with a whisk for about 1 minute carefully so that the flour remains white, doesn't brown and won't burn. Mix the egg yolk and crème fraïche in a seperate bowl. When the sauce thickens add the egg mixture, and cook for about 1 minute. Remove from heat and mix in the cheese. Season with salt and pepper . Add 60 grams of butter in a pan, melt, add spinach and cook the spinach until it is completely depleted. Bring it to taste with salt and pepper. Put the spinach in a baking dish and level it. Divide the eggs on top and pour the Mornay sauce over it. Sprinkle with the grated cheese and put it under the grill for about 10 minutes (check now and then, the cheese should be brown but not burnt). As you used to I present you a lunch recipe. 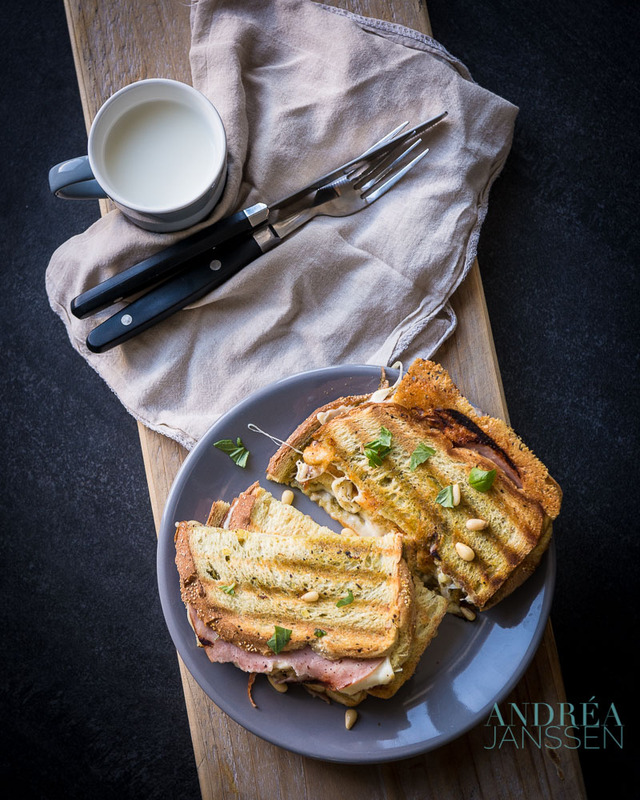 This time a sandwich again (I love a warm sandwich when it’s getting cold), but this time one with a Mediterranean twist. The pesto is also delicious when used through a bowl of spaghetti or to add taste to mashed potatoes. Roast 1 tablespoon of pine nuts on low heat in a dry frying pan until they are slightly colored and smell nutty. Turn of the heat and pour the nuts in a bowl. Set aside. Take the ham and put it in the hot frying pan and on low heat, bake it until it's browned. In the kitchen machine bowl put the basil, old cheese (or Parmesan), 2 tablespoons of pine nuts and 1 clove of garlic. Turn on the kitchen machine and slice everything to very small pieces and until it's well mixed. Add one tablespoon of olive oil at a time and pulse the kitchen machine to mix the ingredients until the pesto gets the right thickness. Take a slice of bread and smear 2 teaspoons pesto on one side. Lay the cheese on the pesto and the ham on the slices cheese. Layer with the second slice of bread and put under the grill until it's done. We usually eat bread as lunch, as a traditional food in the Netherlands. I find that it’s just so delicious when you eat a delicious scented (preferably homemade) bread. But occasionally we deviate from that. Then, for example, we eat pancakes for lunch. 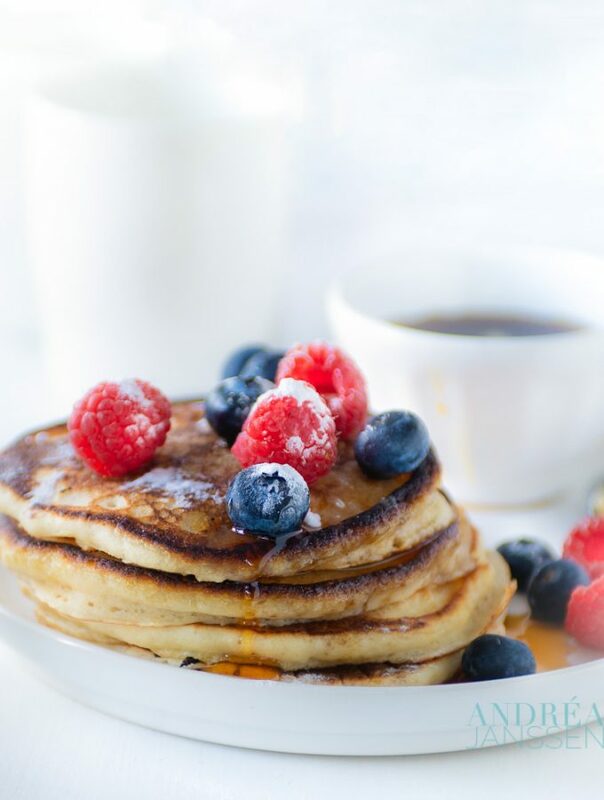 Whereas in countries like America they often have breakfast with pancakes. Pancakes are not common in the Netherlands. We’ve got our own variety called pannenkoeken. The large thinner version of pancakes (but not as thin as crêpes). Are they mini-pannenkoeken or should I imagine something completely different. Here I have taken the test. I adapted a recipe from guru Martha Stewart, who makes almost all of her dishes herself and got started. Conclusion: the pancakes are thicker, lighter, slightly sweeter and at the same time slightly salty. And very tasty, with, for example, homemade jam. But certainly also delicious without a topping. The children were very fond of this, so I can imagine this dish will come around more often at lunch time. In the first bowl mix flour, salt, sugar and baking powder with a fork. In a second bowl, pour the milk and add the egg and oil as well. Mix it well. Add the first bowl to the second while whisking. The batter won't have to be totally smooth, it may contain some lumps. Grab a little oil and brush it in a frying pan. Take 2-3 tablespoons batter and pour into the hot pan. With the back of your spoon, spread the batter into a round form. In a normal frying pan you can bake multiple pancakes at one time. When you see bubbles on the top of the pancake and the top is almost solid, it's time to turn the pancake. Bake the other side for another 2 minutes and serve. 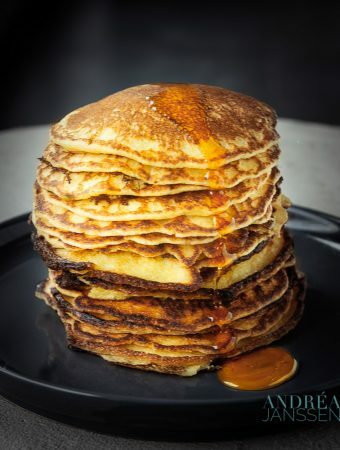 If you do not want to serve them immediately or would like to put everything together on the table, you can keep the pancakes warm in an oven of 100 degrees Celsius. The daring cooks challenge this month was to cook something with a cornmeal batter. And that is a challenge, because I don’t like the most recipes with cornmeal. Except for bread, but that is a recipe for the daring bakers instead of the daring cooks. 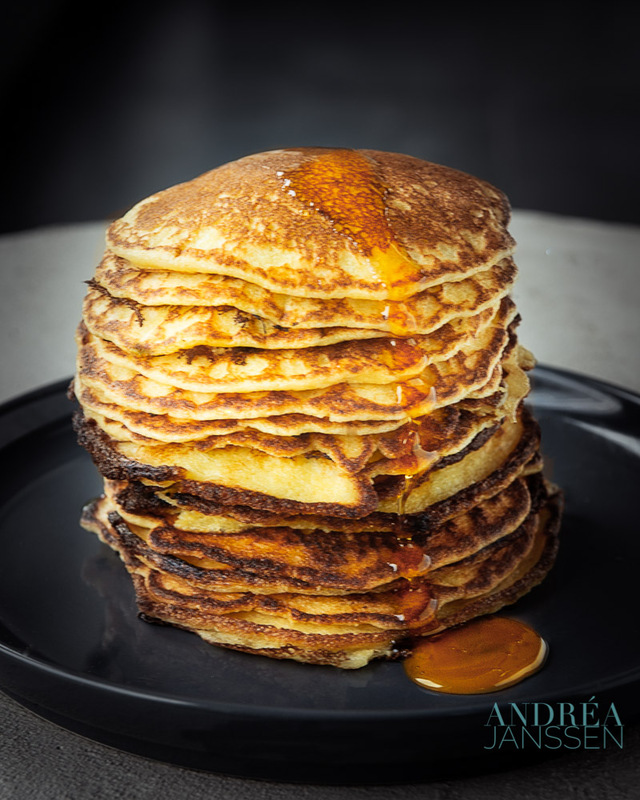 Rachel was so kind to give a few examples and so I got the recipe for fluffy buttermilk pancakes. That’s quite an American recipe. 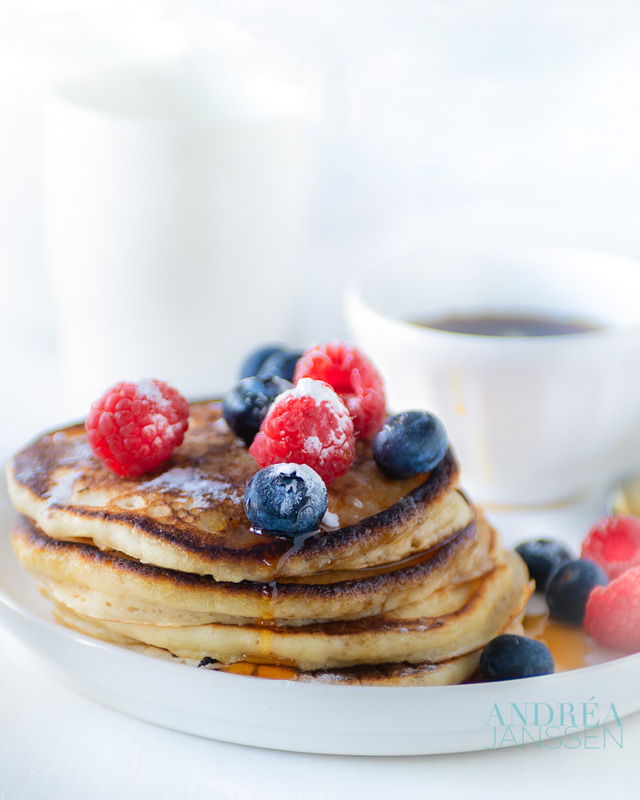 In America pancakes are eaten as breakfast, but that’s not very usual in the Netherlands. We eat pannenkoeken, which looks like it, but it’s still very different and we eat it as lunch. So I though it is a nice recipe for the challenge. And I add maple syrup, which also is quite American. The pancakes did taste very good, so I can see from this day that in my recipe box there is a great recipe with cornmeal (thanks to Rachel and a blog: fullcirclefoodie). Mix in a bowl the solid ingredients. In a second bowl whisk the eggs, buttermilk and butter. Pour this bowl to the first bowl and mix very well, so the clumps are gone. Heat a little bit oil in a frying pan and take 1 ice scoop of batter and pour it in the pan. If you got a large pan you can make a few pancakes at once. My pan is large enough to make three pancakes at once. Wait for about 1.5 minutes and turn the pancakes around. Bake for another minute and the pancake is finished. You can keep them warm in a oven. Serving tip: Poor a little maple syrup on top, for a nice lunch (I still can't quite see it as a breakfast recipe).